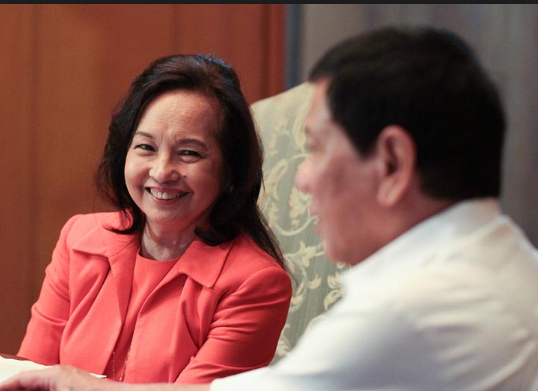 Manila, Philippines – President Rodrigo Duterte has lauded the election of former president and now Pampanga Rep Gloria Macapagal Arroyo as new House Speaker replacing Pantaleon Alvarez, recognizing the latter as economist. The chief executive said on Thursday night that Arroyo could help the government in addressing the country’s economic concerns. “I hope that there’ll be changes, because there’s a new speaker. And it’s a good thing because Gloria is an economist,” Duterte said in a speech in Zamboanga Sibugay. Duterte revealed that Arroyo talked to him last week urging him to do something about the inflation. “She (Arroyo) was the one who called me about two weeks ago to do something about the inflation,” the president said. The Pampanga lawmaker was installed as House speaker on Monday by 184 House members, making her the 21st leader of the chamber and the first woman to hold the post. Meanwhile, the president also disclosed that he would push for the passage of the rice tariffication system bill, to help lower prices of commodities and inflation. This move aims to replace quantitative restrictions on rice imports with a tariff system, which the president tagged as urgent during his SONA. In June, country’s inflation hit 5.2 percent, making it the highest in more than 5 years. Duterte also said that there was a need to generate more jobs for the Filipinos amid the growing economy. “The gross domestic product, right now, we’re doing well. Growth rate is hitting something like 6.7. That’s very good. We’re almost equal with China,” the chief executive said. He cited the need to produce more projects in the provinces to provide more job opportunities there, not only focus in Metro Manila. “What’s difficult is the lack of job opportunities. In Manila, employment is brisk because there are plenty of projects. But here in the provinces there are none,” he added.